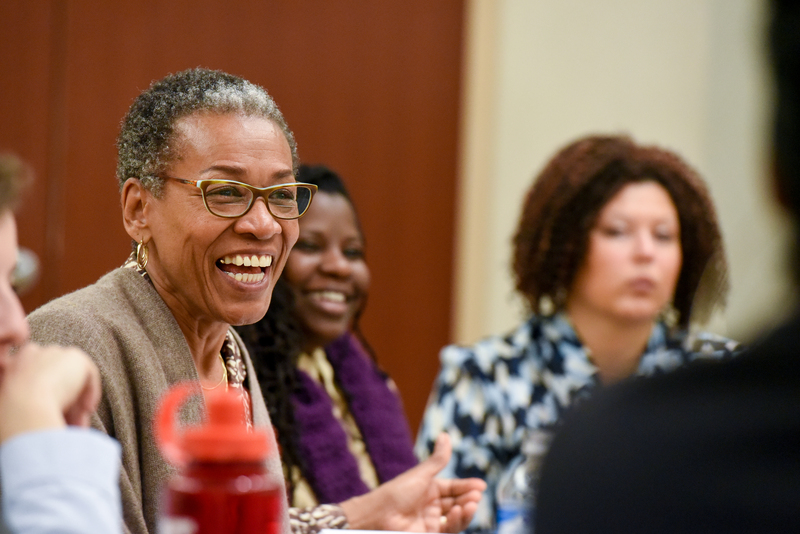 Dr. Alma Clayton-Pedersen, chief executive officer of Emeritus Consulting Group, spent the week at Belmont as part of the University’s Scholar-In-Residence Program, a program created to celebrate diversity within higher education and encourage students to explore the field as a career option. An initiative of Belmont’s Welcome Home Team, the University’s cross-functional diversity and inclusion committee, the Scholar-in-Residence Program invites each of Belmont’s nine colleges to host a diverse scholar in a field related to their disciplines. Clayton-Pedersen was invited to Belmont by Dean of the College of Liberal Arts and Social Sciences Dr. Bryce Sullivan. While on campus, Clayton-Pedersen spent time with faculty, staff and students as she hosted convocation events, participated in luncheons and co-facilitated “My Mentor and Me,” a session held with Dr. Sybril Brown, professor of media studies and Clayton-Pedersen’s mentee. Additionally, Clayton-Pedersen spent time with the Welcome Home Team, led by Vice President and Chief of Staff Dr. Susan West. (L to R) Drs. Clayton-Pederson, Lauren Lunsford, CLASS associate dean, Bryce Sullivan, CLASS dean and Sybril Brown, professor of media studies. For more information on Clayton-Pedersen, click here.